Greer's OC | NATURAL PERFUMES FOR SUMMER TRAVEL! NATURAL PERFUMES FOR SUMMER TRAVEL! Absolutely nothing is like real perfume. In fact --- now that I am a fragrance connoisseur --- I no longer even consider wearing anything less than fine natural perfumes by JoAnne Bassett. Why? Synthetics (and that means all perfumes you buy in drug and department stores) aren’t real and they aren’t good for you either. “Natural” perfumes are handcrafted from the most exquisite ingredients such as precious botanical essences and high-quality oils. For the past couple of years, I have been sporting only natural perfumes. Yes, real perfume is expensive and it is a true indulgence. But as someone with an allergic nose and even more sensitive skin, it is a must in my beauty regimen. Plus, all-natural parfums are good for you in other ways. True floral and earthy essences bring a sense of joy, satisfaction and health to the wearer. Natural fragrances attract positive things and people to your life. Using traditional French methods for creating the finest perfumes, JoAnne only includes the world’s most rare (and in some cases extinct) ingredients such as Bulgarian white rose oil, vintage Mysore sandalwood oil, vintage jasmine sambac, osmanthus, mimosa and tuberose. So, here’s a review of JoAnne Bassett’s summer-loving Josephine perfume as well as more review notes about her incredible Amazing and Dark Mistress scents, which I believe are perfect to wear as a day-to-night fragrances. For the warm summer months, I recommend JoAnne Bassett’s light fragrance, Josephine. This all-natural perfume is perfect to spritz on wrists, necks, décolletage and bellies right before work, before getting on a airplane (or car or train), before dinner and even before bed. Citrus-meets-forest with Josephine’s cooling, yet warming and inviting odors. Just quick spray gives the wearer the irresistible smell of summer’s bounty. Perhaps my two most favorite JoAnne Bassett perfumes are Amazing and Dark Mistress. I love wearing Amazing for day as this floral spray has a pick-me-up feel with refreshing scents of lemon verbena, rose otto, ginger, yuzu and violet leaf. In fact, Amazing contains more than 32 “outlaw” essential oils and absolutes. Just the opposite, Dark Mistress was made for the evening. When sprayed, Dark Mistress fascinates your nose with its mysterious nighttime flower scents and attributes such as night queen, rhododendron, peru balsam, rosewood, damask rose oil, neroli, tuberose, frankinsence, vetiver and vintage jasmine sambac from France. Dark Mistress is formidable! 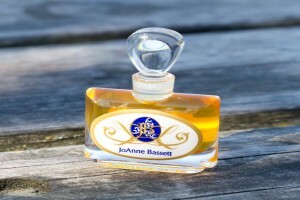 Don’t forget that all of JoAnne Bassett’s luxurious perfumes can be bought in a travel size spray for around $40 each. JoAnne’s glossy black metal travel container with diamond-like studs are rugged, spray nicely and look lovely sitting in your evening clutch. We love taking these all-natural exotic parfums in our purse on road trip getaways. Just a little spray or two really makes you smell fresh, clean and pretty in an instant. Have you ever wanted to learn how to make your own natural perfumes? French-trained parfum couturier JoAnne Bassett, who lives nearby in North San Diego County, also leads perfume-making workshops for groups in San Diego and Orange County. In these two-hour classes, JoAnne teaches women to create their own personal perfumes from botanical essences and organic jojoba oil. At workshop’s end, each participant goes home their own unique scent, which is beautifully packaged in a perfume bottle with glass dauber! The workshop costs $300 per person (or $2,000 for a group of five or more) including all materials. To learn more, visit http://www.JoAnneBassett.com or call 760.309.2571. To buy products on Etsy, visit http://www.joannebassett.etsy.com.